The telecom regulator has backed an open Internet, and proposed tweaks to licence conditions to bar blocking or slowing down of content, while allowing fast lanes for ‘specialised services’ and keeping ‘content delivery networks’ out of the ambit of net neutrality, as it released its much-awaited recommendations on the controversial subject. “Internet access services should be governed by a principle that restricts any form of discrimination or interference in the treatment of content, including practices like blocking, degrading, slowing down or granting preferential speeds or treatment to any content,” the Telecom Regulatory Authority of India said in its 54-page recommendation to the telecom department. Trai has said telecom or Internet service providers should be barred from signing pacts that can lead to discriminatory treatment on the Web, based on content, sender, receiver, protocols or even equipment. It has recommended changes in the licence conditions and other provisions so that the penalties for violating licence norms would be applicable here as well. The regulator has exempted content delivery networks, which do not use public Internet, from restrictions on nondiscriminatory treatment. Analysts said this will benefit telcos such as Reliance Jio and Bharti Airtel, who are trying to create their own content ecosystems. The regulator has left it to DoT to decide the ‘specialised services’ that can be exempted from the purview of net neutrality. It clarified that this tag should only be applicable to those services where optimisation was necessary to meet specific quality of service needs. 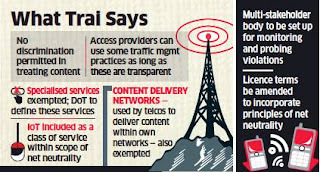 Trai also allowed carriers or Internet access providers to use some traffic management practices on their networks to ensure quality of services, preserve security of networks, providing emergency services and for implementing a court order or government direction, as long as they are transparent and their impact on users is declared. Net neutrality activists appeared to be satisfied with Trai’s proposals. 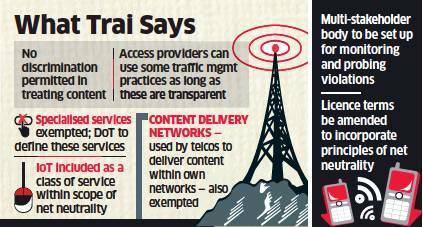 DoT will take a final view on Trai’s recommendations. The government has so far been vocal about its backing for a free and open Internet, and has opposed the so-called ‘walled garden’ within which certain content is prioritised. 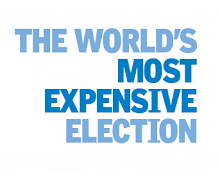 But telcos were upset that while they have to adhere to net neutrality guidelines, these would not apply to over-the-top players such as WhatsApp. They also opposed the proposal to include Internet of Things, expected to be a big revenue generator under 5G technology, within the ambit of net neutrality.